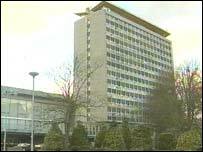 A decision has been made to press ahead with plans that could see the demolition of Plymouth's Grade II listed civic centre. Councillors decided to follow report recommendations at a meeting for a new building to be built at the Bretonside bus station. The city council said it needed to move because the old site was too expensive to maintain at a cost of £45m. The building at Bretonside would include a new bus and coach station. The idea being put forward includes a partnership with a private sector developer who would knock down the present tower block, after building a new one at Bretonside. A report had recommended that it would be better to demolish the 40-year-old civic centre rather than maintain and refurbish it. The existing building was listed by the Department for Culture, Media and Sport in June. The money from the sale of the existing civic centre site would go towards the new building at Bretonside and would be better economically, the report said. The report also suggested the redevelopment of the civic site would include a new library. Cllr Ian Bowyer said: "The listing of the building has created a huge difficulty for us and we have spent considerable time and effort looking at all the scenarios that it created. "Using the Bretonside site would not only provide new accommodation for the council that would be easily accessible to our customers but also the long awaited new bus and coach station. It would also support the regeneration of this part of the city."